Output 95.3.2 displays the model information and summary statistics for the variables in the model. In Output 95.3.3, the first plot is for the intercept. 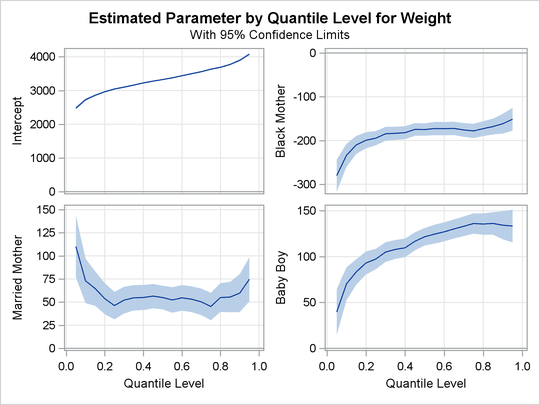 As explained by Koenker and Hallock (2001), the intercept "may be interpreted as the estimated conditional quantile function of the birth-weight distribution of a girl born to an unmarried, white mother with less than a high school education, who is 27 years old and had a weight gain of 30 pounds, didn’t smoke, and had her first prenatal visit in the first trimester of the pregnancy." In Output 95.3.4, the first three plots deal with prenatal care. Compared with babies born to mothers who had a prenatal visit in the first trimester, babies born to mothers who received no prenatal care weigh less, especially in the lower quantiles of the birth-weight distributions. As noted by Koenker and Hallock (2001), "babies born to mothers who delayed prenatal visits until the second or third trimester have substantially higher birthweights in the lower tail than mothers who had a prenatal visit in the first trimester. This might be interpreted as the self-selection effect of mothers confident about favorable outcomes." The fourth plot in Output 95.3.4 and the first two plots in Output 95.3.5 are for variables that are related to education. Education beyond high school is associated with a positive effect on birth weight. The effect of high school education is uniformly around 15 grams across the entire birth-weight distribution (this is a pure location shift effect), whereas the effect of some college and college education is more positive in the lower quantiles than the upper quantiles. 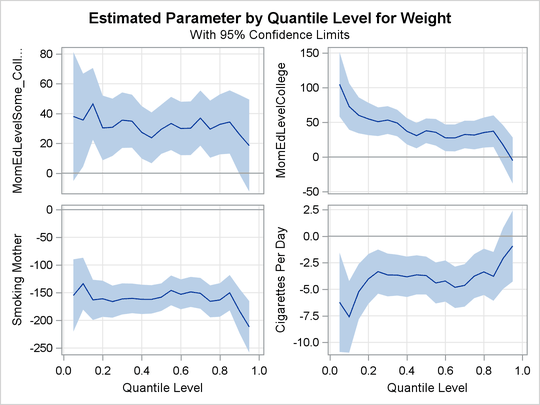 The remaining two plots in Output 95.3.5 show that smoking is associated with a large negative effect on birth weight. The linear and quadratic effects for the two continuous variables are shown in Output 95.3.6. Both of these variables are centered at their median. At the lower quantiles, the quadratic effect of the mother’s age is more concave. 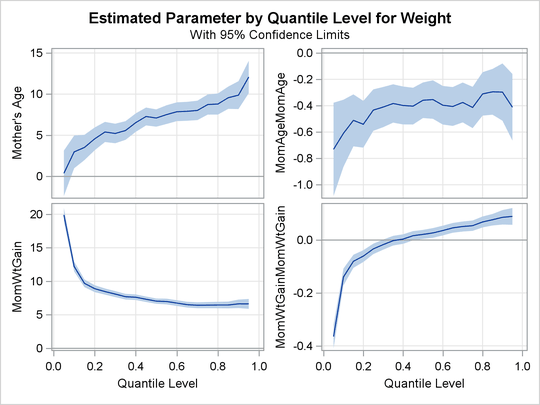 The optimal age at the first quantile is about 33, and the optimal age at the third quantile is about 38. 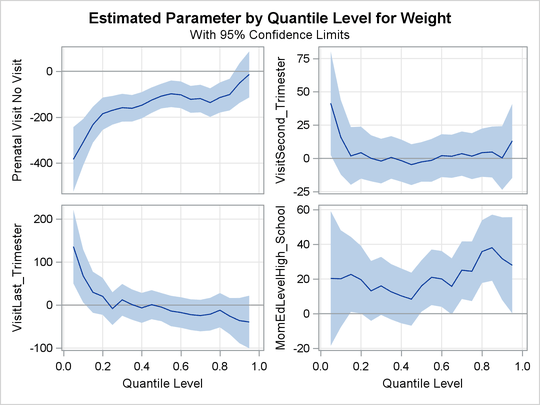 The effect of the mother’s weight gain is clearly positive, as indicated by the narrow confidence bands for both linear and quadratic coefficients.